A steady stream of air is drawn into the inlet, which feeds into the Compressor. 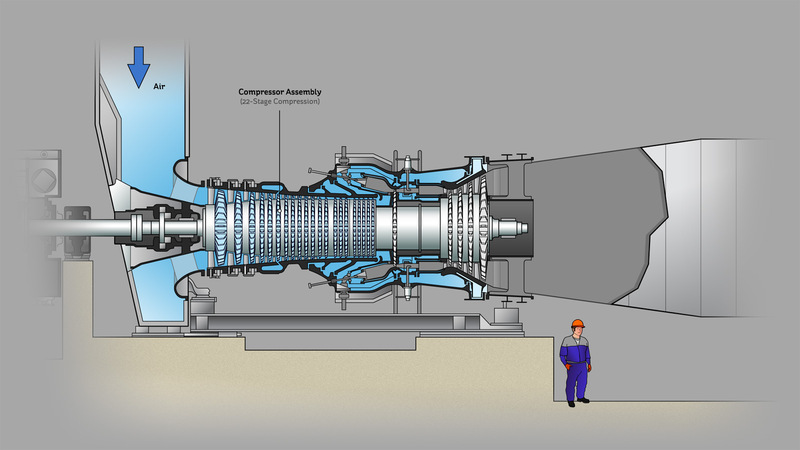 The Compressor section uses a series of rotors and stators to densely pack the air in order to feed the Combustion Chamber sufficiently and efficiently with highly pressurised air. Air enters the Compressor in Aghada via variable inlet guide vanes (1) and it journeys through 22 stages of compression along the horizontal axis before reaching the Combustion Chamber. Each section of the Compressor houses rotor blades and stator vanes. The moving rotors add impact pressure to the air stream. As the air rolls off the rotor within each section it is full of impact pressure. The air then moves through fixed position stator vanes that are set up as a divergent duct (the complete opposite of a petrol funnel). The high velocity air passes through the narrow entry point of the duct and then slows down gradually and it moves across the widening flow path. The divergent flow path causes the impact pressure supplied by the rotor to be converted into static pressure as the air flow slows down. The highly compressed air exits stage 22 and enters the first Combustion Chamber (2). The air flow is calibrated so as to match the methane supply in a ratio of about 17.2 parts air to 1 part natural gas. In the Combustion Chambers the chemical energy from the natural gas is released efficiently.